anyway ... about corridor : "our kitchen's focus is rustic farmhouse, midwestern food highlighting sandwiches & artisan pizzas baked in a clay hearth oven & other artisan provisions." mmm. 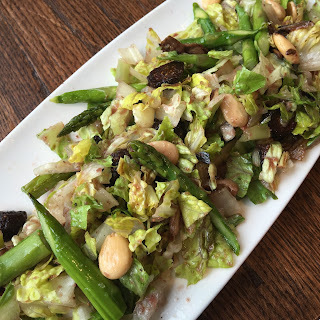 romaine, mission figs, marcona almonds & lemon tarragon vinaigrette. i subbed romaine for the arugula. (i'm off argula lately ... too potent.) this salad was surprisingly delicious. the dressing was light, but not too light. the figs added the perfect amount of sweet ... & damn. i forgot how much i love asparagus. all in all, really the perfect summer salad. given the proximity to my apartment & the tastiness of my first visit there, i'll certainly be back to corridor. i asked our waitress on the way out if the pizzas could also be prepared vegan & she believed they could be ... so i'll likely try that next time. until then! The particular distance to be able to my own condominium & the particular tastiness regarding my own initial check out right now there, i am going to undoubtedly become returning to corridor. my partner and i questioned our own waitress along the way out there in the event the chicken wings is also well prepared vegan & the lady considered they are often... thus i am going to probably test in which the next occasion. right up until next.